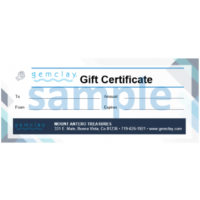 A GemClay Boutique and Day Spa Gift Certificate is the perfect way to treat someone special! Available in a wide variety of denominations, our Gift Certificates can be used for exclusive GemClay products as well as day spa treatments - they can even be used at Mount Antero Tresures for our beautiful aquamarine jewelry! Tuck one inside a Gift Basket, slip it inside a birthday or anniversary card, or add it to a jewlery purchase.